With so many options for buying food now, recommendations from Local Mums are a big help when deciding where to spend your hard-earned cash. "I would like to recommend�Yours Locally�to all Local Mums. Everything was so beautifully presented with really generous portions. I love the Beef Topside! The Organic Carrot cake is delicious and I will definitely be ordering the Apple & Ginger drink again." "I highly recommend�Yours Locally�to all Local Mums. Their presentation of products is lovely. I especially enjoy the Lemon Drizzle Cake and I love the ice-cream! The Apple & Ginger drinks are wonderful and have amazing health benefits - I've ordered a full case of them!" 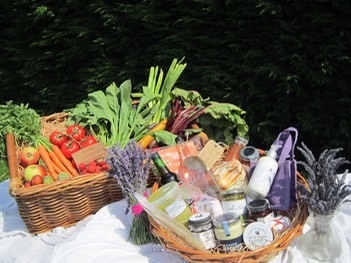 Yours Locally�is a Surrey-based delivery company supplying 'Local Produce to Local People'. We have sourced a wonderful selection of fresh, quality and affordable produce from local farmers and producers - all from within a 30-40 mile radius. to start your hassle free, shopping experience - and have it all delivered straight to your door! Our aim is to highlight the wonderful produce available - right on our doorsteps - in fact we'll even deliver it all to your doorstep, making it all that much easier and convenient for you. But just how local is local? 30-40 miles we feel is a sensible radius for our produce to travel, no more. This radius takes us as far as the south coast, so we will soon be adding an extensive selection of fresh fish and shellfish, caught daily to our products list! Can we really source a varied enough range of produce? You'll be surprised at the great selection of produce we have sourced from within our target radius. Our products include; Handmade Cheeses, Smoked and Fresh meats, Game (when in season), Poultry, Artisan Breads and Handmade Pastries, Seasonal Produce, Free Range Eggs, Dairy produce, Juices, Soups, Sauces, Vegetarian, Vegan & Gluten Free dishes, Wholemeal Pizza's, Chutneys, Honeys, Beeswax Products - including bath bombs and soaps. Award winning Curry Sauces, pickles and chutneys, real Dairy Ice Cream - produced entirely from 'cow to freezer in under an hour', a mere 6 miles away, to name just a few items. We've even sourced a natural mineral water producer just five miles away! It is quite amazing what we have available on our doorsteps and as our products haven't travelled halfway around the world, they will be fresher and healthier. Our own local economy will benefit from increased demand and crucially, as all products will have only come from within our target radius, we won't be adding to the global food distribution problems known as 'excess food miles'. We hope you enjoy browsing through our website and discovering, as we have, the wonderful range of products available right on our doorstep.